Weidmüller Omnimate Data range of RJ45 jack transformers with integrated compensation offers modular designs customisable for all your needs. They are available in varieties suitable for THT or THR soldering process in a range of designs, and have been specially designed to use as little board space as possible. Browse for the connectors available from stock below; other models are available at short lead times if required. The RJ45G1 R1D 3.3E4G/Y TY jack with transformer from the Weidmüller Omnimate data range, offers twin magnetic transmitter sockets for gigabit applications (1000 base-T) with integrated compensation, which actively counteracts inductive and capacitive couplings as well as saves space on the PCB. This RJ45 jack with transformer connector by Weidmüller feature 10 poles with an outgoing elbow of 90° and extended temperature range of −40°C to +85°C. The RJ45G1 R1V 3.3N4YG/YG TY jack with transformer from the Weidmüller Omnimate data range, offers magnetic transmitter sockets for gigabit applications (1000 base-T) with integrated compensation, which actively counteracts inductive and capacitive couplings as well as saves space on the PCB. 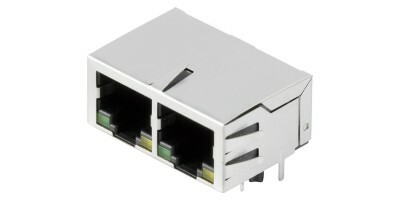 This RJ45 jack with transformer connector by Weidmüller features 10 poles with an outgoing elbow of 180° and extended temperature range of −40°C to +85°C. The RJ45M R12D 3.2N4G/Y RL jack with transformer from the Weidmüller Omnimate data range, offers twin magnetic transmitter sockets for gigabit applications (1000 base-T) with integrated compensation, which actively counteracts inductive and capacitive couplings and saves space on the PCB. The RJ45M twin jack with transformer connector by Weidmüller features 8 poles with an outgoing elbow of 90° and extended temperature range of −40°C to +85°C. The RJ45M R1D 3.3N4Y/G TY jack with transformer from the Weidmüller Omnimate data range, offers a magnetic transmitter socket for gigabit applications (1000 base-T) with integrated compensation, which actively counteracts inductive and capacitive couplings and saves space on the PCB. The RJ45 twin jack with transformer connector by Weidmüller features 8 poles with an outgoing elbow of 90° and extended temperature range of −40°C to +85°C. The RJ45M R1V 3.3N4Y/G TY jack transformer from the Weidmüller Omnimate data range, offers a magnetic transmitter socket for gigabit applications (1000 base-T) with integrated compensation, which actively counteracts inductive and capacitive couplings and saves space on the PCB. The RJ45 jack with transformer connector by Weidmüller features 8 poles with an outgoing elbow of 180° and extended temperature range of −40°C to +85°C. The RJ45M R1V 3.3N4YG/YG TY jack with transformer from the Weidmüller Omnimate data range, offers a magnetic transmitter socket for gigabit applications (1000 base-T) with integrated compensation, which actively counteracts inductive and capacitive couplings and saves space on the PCB. The RJ45 jack with transformer connector by Weidmüller feature 8 poles with an outgoing elbow of 180° and extended temperature range of −40°C to +85°C. The RJ45M T12D 3.3E4G/Y RL jack with transformer from the Weidmüller Omnimate data range, offers twin magnetic transmitter sockets for gigabit applications (1000 base-T) with integrated compensation, which actively counteracts inductive and capacitive couplings and saves space on the PCB. The RJ45M T12D 3.3E4G/Y RL by Weidmüller features 8 poles with an outgoing elbow of 90° and extended temperature range of −40°C to +85°C. The RJ45M T1D 3.2E4N TY jack with transformer from the Weidmüller Omnimate data range, offers a magnetic transmitter socket for gigabit applications (1000 base-T) with integrated compensation, which actively counteracts inductive and capacitive couplings and saves space on the PCB. The RJ45M T1D 3.2E4N TY by Weidmüller features 8 poles with an outgoing elbow of 90° and extended temperature range of −40°C to +85°C.